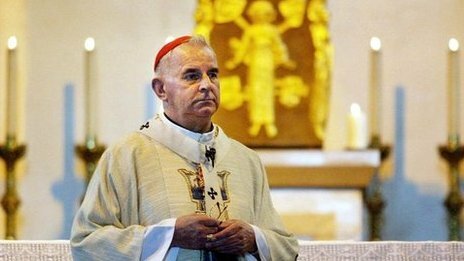 Cardinal O’Brian, the only British Cardinal, starts off (20 years ago) as a moderate within the church, upsetting conservative Catholics with his liberal views on contraception, homosexuality and whether priests should marry. Over time however, as the Vatican became increasingly hard line, he seemed to swing towards the right, becoming a strident and belligerent voice proclaiming the need to Christian morality, family values and for Conservative Catholicism. 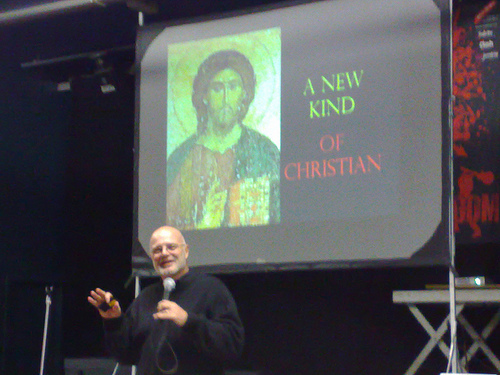 There was even talk of him being the next Pope. Last year he made a splash because of his rather bizarre comment comparing Gay Marriage to slavery. I wrote about it at the time, here. Then, totally out of the blue, in the wake of the shocking resignation of the Pope, just as Cardinal O’Brian is about to go to Rome to take part in the election of the next Pope, 4 men- three priests and one ex-priest, let it be known that he used his power and authority to impose sexual acts on them whilst they were young men. He initially denies it. The Church starts to close ranks. Then he admits it and resigns his office. I was also staggered by the scale of the fall of this man- for whom I feel great sympathy. I know what it is like to be trapped in an unyielding and inflexible hermaneutic- to resort to compartmentalism to cope with the cognitive dissonance. Many people describe O’Brian as a good man, a kind man who has the capacity for so much good. None of us are just one thing, we are all many- and those who attack him should beware throwing the first stone. Finally, I feel a collective shame for the Church. Scandals like this confirm the worst of prejudice about what the Church has become- it tells the world that we are that most despicable thing- we are hypocrites. This story proves our guilt- and the guilt is collective. As soon as we (the Church) begin to stand on moral high ground, we will always be in danger of the crumbling cliff edge. That is NOT to say that we should have no moral voice. Our job is to be a people who present a radical alternative. We are to be an irritant and conscience of those in power, not because we are better than others, but because we are prepared to try this thing called love. All morality is captured by this simple word- love. As soon as love is subordinate to morality, then morality becomes the worst form of religion. Which were brought to me again when listening to clip in my previous post. In my case, I inherited a theology that told me exactly what you said: homosexuality is a sin, so although we should not condemn (i.e. stone them), we must tell people to “go and sin no more.” Believe me, for many years as a pastor I tried to faithfully uphold this position, and sadly, I now feel that I unintentionally damaged many people in doing so. Thankfully, I had a long succession of friends who were gay. And then I had a long succession of parishioners come out to me. They endured my pronouncements. They listened and responded patiently as I brought up the famous six or seven Bible passages again and again. They didn’t break ranks with me and in fact showed amazing grace and patience to me when I was showing something much less to them. Over time, I could not square their stories and experiences with the theology I had inherited. So I re-opened the issue, read a lot of books, re-studied the Scriptures, and eventually came to believe that just as the Western church had been wrong on slavery, wrong on colonialism, wrong on environmental plunder, wrong on subordinating women, wrong on segregation and apartheid (all of which it justified biblically) … we had been wrong on this issue. In this process, I did not reject the Bible. In fact, my love and reverence for the Bible increased when I became more aware of the hermeneutical assumptions on which many now-discredited traditional interpretations were based and defended. I was able to distinguish “what the Bible says” from “what this school of interpretation says the Bible says,” and that helped me in many ways. I want to add one more brief comment. You ask, if we change our way of interpreting the Bible on this issue (my words, not yours) “- what else will happen next?” Here’s what I hope will happen. After acknowledging the full humanity and human rights of gay people, I hope we will tackle the elephant in the room, so to speak – the big subject of poverty. If homosexuality directly and indirectly affects 6 – 30% of the population, poverty indirectly and directly affects 60 – 100%. What would happen if we acknowledged the full humanity and full human rights of poor people? And then people with physical disabilities and mental illnesses and impairments? And then, what after that? What would happen if we acknowledged the spiritual, theological, moral value – far beyond monetary or corporate value – of the birds of the air, the flowers of the field, of seas and mountains and valleys and ecosystems? To me, Jesus’ proclamation of the reign or commonwealth of God requires us to keep pressing forward, opening blind eyes, setting captives free, proclaiming God’s amazing grace to all creation. What he is able to do here is lift our eyes from a grubby obsession with what goes on in people private bedroom space to the call of the Kingdom of God. This is the greater charge of hypocrisy that I feel myself constantly to be under. How all the distractions and comforts of my life and lifestyle prevent me from living as a full agent of the commonwealth of God as spelled out above. This entry was posted in Spirituality and tagged Brian McLaren, Cardinal, cardinal o'brian, gay marriage, homosexuality, homosexuality and christianity, Kingdom of God, Pope by Chris Goan. Bookmark the permalink.